#TSJ Breaking News. Janet stands unassisted. I’m very excited to tell you all that at 10:42pm PDT today, Janet stood unassisted! We had finished getting ready for bed and while transferring from wheelchair to bed I had her stand up nice and tall while I held onto her. This is a common end of the day thing and I try to see how much of her weight she can take. Tonight felt different right from the start and her feet looked to be planted firmly on the floor so I let go and could feel her trying to keep her balance. It took a couple of tries then she actually stood there all by herself for maybe two or three seconds. She repeated it twice then I gave her a rest so I could set up the iPad to record it in case I was dreaming. Here’s the video, not the best angle but what do you expect at this hour? Janet could not have been more excited this past week leading up to Laurel and Raj’s Christian wedding ceremony on Saturday. That excitement enabled Janet to accomplish a lot as she was almost forced to be on a high level of alert all day everyday. She sometimes found it hard to let go and calm down at night with Thursday being especially difficult as she hardly slept at all. To be able to not only witness but also contribute to the wedding was huge for Janet and it was very exciting for me to watch her take it all in. Thursday started with a phone call from Janet just after noon wondering when I was going to be at Connect to pick her up. I reminded her I said I’d be there at two but she said that was too late. I managed to get there by 1:30 just as she and Jess were finishing making her bed. It had been a busy morning with good reports from the gym and an outstanding report from Mary Lou regarding Janet’s speech. Jess said she was out on the patio while Mary Lou and Janet were working in the Den, a good twenty meters away, and she could hear Janet from there. Impressive. After running an errand downtown, Andrew, Laurel, Heather and my mom joined us for a trip to The Flower Farm for a few decorative features for the wedding. 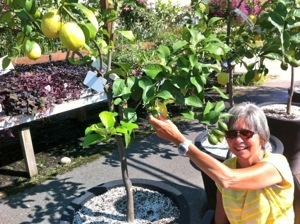 We all were a little dissapointed with the selection and service but were very surprised and impressed by the lemon trees. Who knew? 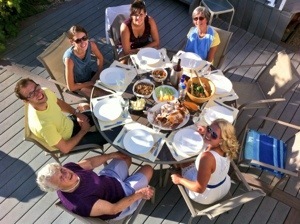 My mom was determined to serve us all a turkey dinner so despite the thirty plus degree temperature outside, that’s what we enjoyed. Thanks mom! So ended a very bright day for Janet, or so I thought. Her mind must have been working overtime as she was very restless all Thursday night, waking frequently to tell me she couldn’t sleep or was uncomfortable. It all peaked at 3am when she insisted on going for a walk. Noting that she wasn’t kidding and was half way out of bed I decided to go along with her crazy idea and got out of bed to assist. Once up, she very confidently took a good step with her left leg then followed nicely moving her right leg forward. That was not a step, more like a drag, but it was impressive none the less and she repeated it three or four times down the side of the bed. I held probably ninety percent of her weight but all the movement was her. When she’d had enough we got back to where she started from and she managed a little bit of sleep for what remained of the night. After regaling the household with her story over breakfast it was time for some wedding baking. Laurel and Heather allowed Janet to help them make some desserts for the big event and Janet loved being helpful and hanging out with her daughters. The house was buzzing all day and Janet really fed off that energy. We got into the pool for a good long swim where Janet did her best ever take off for swimming on her tummy and also took a breath while swimming. As long as the water is warm she continues to improve in the pool. The big day finally arrived and after the prerequisite good morning, the first words out of Janet’s smiling mouth Saturday morning were, “Laurel and Raj are getting married today”. She was up and going by 8:30 and you could tell this is what she’d been waiting for. 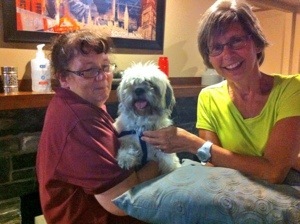 Again, the house was buzzing as Cam arrived then Mary/Gaga and Keith after their massively delayed flight from Toronto. The last bit of decorating involved cutting out some foam hearts to lay on the pool and Janet was happy to help with that before Heather and Laurel took her behind closed doors to get dressed. After I don’t know how many mimosas the ladies emerged looking stunningly beautiful. It must have been water proof makeup the girls put on Janet because as soon we sat down for the ceremony, the tears started flowing but her face stayed radiant. The ceremony was blessedly short due to the heat but very truthful, practical and personal. Thanks Roger and Carrie for being such special people to our family. Laurel and Raj each did a terrific job delivering their vows to each other and I can’t think of any better way for Janet to witness their “second” marriage. Janet’s short term memory is showing signs of improvement and I’m sure she’ll remember this day for a long long time. The “reception” part of the day was very casual with everyone invited to jump in the pool, play bocce or just hang out. Janet happily went for a swim and loved being in the water with a bunch of others especially Laurel and Raj’s niece and nephews. 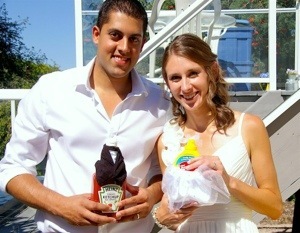 A few years ago Laurel and Raj dressed up as mustard and ketchup for Halloween so in preparation for their first wedding Janet made bride and groom mustard and ketchup bottles that were to be placed near the cake in fun. She finally got to present them this time and got a good laugh for doing so. I thought Janet might be so wound up she’d never get to bed but she was lights out at 10:30 after a very very good day. Up early again, the goodbyes started early Sunday morning with Cam running out the door first with Heather and Allan scheduled to follow after breakfast. Note that I said Heather and when you are talking about her and flying you can bank on a delay. Sure enough, they were able to stay for lunch before heading to the airport for a trip that ended up being four hours longer than planned and minus a set of luggage too. I don’t have to tell you who’s do I. It was nice to be able to chill and visit during their delay so that was the silver lining. As expected there were lots of tears when the time finally came but those were cleared up when Janet was reminded of all the fun things that happened over the last few days. Having only active seniors left to entertain we headed up to the Myra Canyon trestles for a nice walk. Unfortunately I turned too soon and we ended up at the wrong end of the park where the road is very bumpy and the trail to the trestles not exactly wheelchair friendly. It was still a nice outing and a good break from the heat for those that wanted it. After a nice swim and hot tub we all went to dinner at The Rotten Grape. Janet was a little uncomfortable in the backless bar stool this time so we switched to a tall stool with a back and that seemed to work much better. We said goodnight and goodbye to Mary/Gaga and Keith before winding down with a little TV and the lights going out at 11:15. I think by this time Janet was starting to feel relieved that the craziness was over. She slept very well Sunday night and woke up happy and ready to start Monday at 8am. My mom joined her in watching Pick a Puppy and Janet picked the right one again and is now 4/5 all time. After a brief walk around the KGH neighborhood Janet had two very strong swimming sessions which included a first ever walk using the parallel bars. We had attempted this before but Janet’s strength and balance just weren’t there, now they are. Fun to watch. 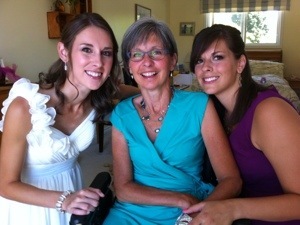 We had a nice chat with Moira on the way out and Janet was beaming as she told of Laurel’s wedding. We are so blessed to have so many caring people involved in Janet’s rehab and even though Moira is no longer directly involved she still makes time to connect with Janet each time we see her and the more that happens the more Janet connects back. Good stuff. My mom loves soup and sandwich places so we hit The Marmalade Cafe for lunch before dropping her at the airport for her on time flight to Nanaimo. Mom, we are grateful you could be part of this weekend and thank you for the turkey dinner, the huge amount of yard work and everything else you did for us. By the time we got to the Connect parking lot Janet was in tears and not wanting to go back. We worked it out, she had a nap then a really good dinner followed by a solid workout on the Shuttle. 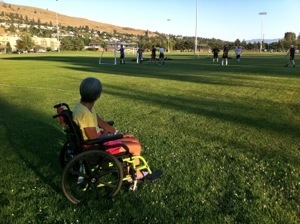 We couldn’t let a beautiful evening go to waste so we walked over and watched Karl and Humberto play soccer. Janet really enjoyed that and was in a good enough mood to do forty five minutes in the Standing Frame before bed. She timed her workout really well and drank an entire bottle of water during it with no nagging from me. A first! Janet is getting to be more and more like the former Janet all the time now and when she called me Tuesday afternoon I heard her true voice for the first time since this all started. It was exciting and a little creepy at the same time. When I arrived she was very chatty and we talked in her room for a long while before going for a walk. 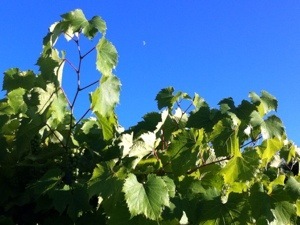 Along the way we practiced the months of the year stating the special days that occur in each. Janet got most family birthdays right and shocked me by getting the first day of Spring in March. I hadn’t even thought of that one before she said it. With a very busy Wednesday looming Janet went to bed after her evening workout a little unsure of what to expect. Jess brought Janet to KGH this morning where I met them for a chat with Dr. Miller. He reinforced the need for Janet to be at Connect for the forseable future and as long as she is improving. He noted a huge improvement in Janet’s cognition since he saw her a month ago and gave validity to my suggestion that the Baclofen was having a negative effect on her. Janet impressed him so much this morning that he told her “with your brain injury, you should not be talking to me the way you are now”. Janet accepted his compliments and praise almost completely today saying she “feels more alive”. Awesome meeting. On our way out Janet’s celebrity status took over as a bunch of nurses stopped to say hi. Janet spoke very clearly and smiled a lot this time showing her growing confidence. While she was in the bathroom over near the OT department, Erika, the head nurse came looking for us. She was about to interview Emma for a position on the Rehab Unit and knew we’d like to see her and vice versa. It was great to see Emma again, in my opinion the best nurse Janet’s had during this ordeal, unfortunately all Janet got was a peak through the bathroom door. I’m sure we’ll see more of Emma soon as I told Erika there’s no need to interview her, just hire her, and she agreed. Our next appointment was the hand clinic to see about a splint to assist with positioning of Janet’s right wrist and hand. Julie took a good look at Janet and fashioned a splint right before our eyes that is already helping. When I took it off at bedtime tonight Janet’s hand was very relaxed and I was able to open her hand with her wrist fully in a neutral position, something I haven’t been able to do since this started. For now Janet will wear the splint two hours on and one hour off with a follow up with Julie scheduled for next Friday. We rushed back to Connect for our team meeting and had a very productive session with the Connect team. Everyone is pleased with Janet’s progress with Mary Lou describing the difference in Janet’s speech like “night and day” over the last seven to ten days. 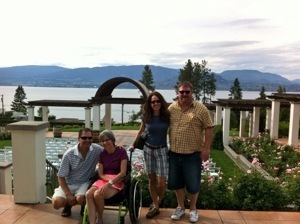 I am very thankful for the hardworking and supportive group of professionals working on Janet’s behalf. Automatically thinking Janet would need a nap after a day like that I proceeded to get her ready to do so. She allowed me to lay her down but as soon as she realized what was going on she got quite upset and got herself right back up insisting she do the Standing Frame now because she hates doing it late at night. She did a full hour in it followed by a really good gym workout with Garrett.That left the evening free for a nice walk and an attempt at doing some video for this blog update. I wasn’t happy with it so you are stuck reading my words again. Maybe next time. As long as Janet continues to improve she will stay at Connect and I’m grateful we have that resource. There will now be an effort made to get Janet busier around there and we will explore some volunteer opportunities in the community as well. It feels like another door to Janet’s recovery has opened and I pray we can take full advantage of that to push her to the next level. Thank you readers for all your support and thank you to our Lord and Savior for His Love, Mercy and Grace. 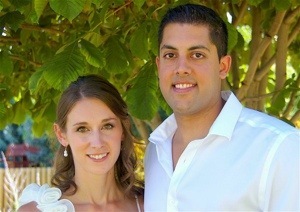 Today’s ceremony for Laurel and Raj is being broadcast live on Livestream beginning at 2:30 PDT. Use this link to connect. Another progressive week for Janet with some interesting trends starting to show. On Thursday Janet was basking in the sun waiting for me with a big smile and a self initiated kiss. When I asked her why she was waiting for me she said “now we can have some fun”. Nice to know that she still thinks that way sometimes as most of the time she complains about all the things I make her do. To start our fun we went for a nice long walk. Janet is improving with her directions and did well at naming things we saw along the way. We really took our time and I tried to keep her talking and observing as much as possible. As we returned to Connect we noticed the ice cream stand was very busy and I suggested we go there after dinner. No surprise, that got a very positive response. There was a CFL football game on TV as we waited for dinner and to prove her cognitive gains Janet said she was cheering for Saskatchewan over Toronto. That’s my girl. Not that I really care, as real football doesn’t start until September but it was still fun to hear her pick against her hometown. 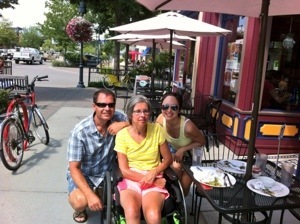 Janet had a good Shuttle routine and shocked me by choosing to do the Standing Frame before going for ice cream. There was a real risk of missing the ice cream by doing this but I had to honor her choice. We made it to the stand in time and Janet enjoyed her mint chocolate chip while spilling only one little drop. 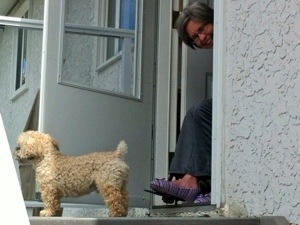 On Friday, Janet was waiting on the patio again but was a little upset that I wasn’t there sooner. It was only 1:30 but I guess she’d had a fairly quiet day so far and was aware she would be going home with me so was looking forward to that. We made some shopping stops along the way, one of which resulted in Janet getting some clip-on sunglasses. She’d been refusing to wear her regular ones as she can’t see well without her prescription glasses so her optometrist suggested the clip-ons and I think they work great. Janet doesn’t mind wearing them so if nothing else her eyes get some protection now. By the time we got home it was too late for a nap so Janet just had a little quiet time lay down then got ready to go for dinner with a friend of ours from Nanaimo. The Rotten Grape turned out to be an excellent choice as we were able to sit outside in the sun listening to the Music in the Park happening right across the street. 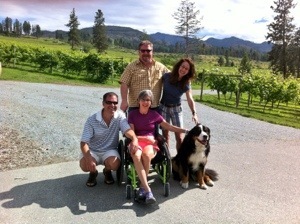 We even had a visit from Janet’s former PT, Tom. It was really nice to enjoy good food and conversation with Wendy and Janet really impressed us by sitting on a backless stool the entire time. After a good hot tub at home and while getting ready for bed Janet called Nash, Calamity. That was the name of one of our cats that died a few years ago. Janet realized that almost as soon as she said it but was upset that she didn’t realize Calamity had died. Took her a good fifteen minutes to get over it. We were up pretty late Friday so Saturday started off late with a nice Skype chat with Mary/Gaga. I then put Janet to work as we cleaned up the spare room in preparation for Laurel & Raj 2.0. Janet had fun with lots of laughs as we found things we hadn’t seen in a long time, one thing in particular I hope you’ll here a lot more of in the near future. Stay tuned. The more I get Janet to help with domestic stuff the more I realize how much she wants to contribute. She really goes at a task with determination and concentration and is visibly pleased when its done, usually asking if there’s anything else to do. That is, as long as she feels she can do it but occasionally now she’ll take my suggestion that she can do it and run with it. Previously my suggestion was met with self doubt. I’m seeing a little less of that now. Almost as impressive as her domestic enthusiasm was Janet’s choice for lunch Saturday. Grilled cheese with BACON! Totally her idea, never seen her eat it before and did she ever eat it. That gave her enough energy to do a little house hunting with me followed by a stop at the grocery store. Wanting to press on she insisted we go to church which turned out to be a good call on her part. 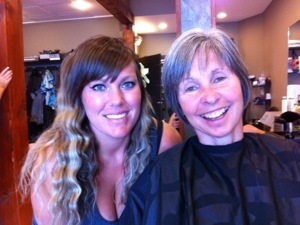 She was able to have nice visits with quite a few people there and the service was really good too. Our evening was quiet and Janet wound down nicely to wear she was sleeping by 10:30. Start time Sunday was a little more normal but Janet maybe should’ve stayed in bed a little longer as for once she picked the wrong puppy on Pick a Puppy. She’s now three for four and was a little upset about being wrong. We went for a rather long walk to a local store for some dinner supplies and Janet asked to take a shorter route home so I guess it was a little long. Our thirty degree pool water was too cold for Janet so after a relaxing hot tub I laid her down for a good nap. We had another hot tub after dinner then Janet passed on ice cream in favor of going to bed. Lights out at 9:45 seemed strange but sleep is good. .She was also a huge help in dusting some shelves and nick nacs and again I could see the satisfaction she was getting from being able to help. Relaxing in the sun with a Fresca Janet explained she was afraid she’d miss something if she wasn’t coming home until Thursday. She also came out with the comment that “it’ll be awkward having Chris here”. Chris is Janet’s first husband and their parting was not amicable but I assured her he would be polite and so should she. Janet hasn’t talked about the battles she went through in that former life since she got sick but I hope the encounter on her home turf on a happy occasion leads to truly forgetting all that nonsense and moving on. It will be fun to see. Janet and I had a lot of fun eating dinner outside on an absolutely gorgeous evening and it was really difficult to gather the motivation to head back to Connect. By the time we got there Janet was pretty much done and after a little bedtime reading it was lights out at 9:30. After a busy Tuesday morning I met Janet and Brian at KGH for her appointment with Dr. McCann. The main goal for this one was another round of Botox, this time, both hamstrings and a little in her right arm finger flexors. The previous treatment was a huge success and we are looking forward to similar results this time. The decision to treat the finger flexors came as a result of Janet clenching her right hand less and its hoped the Botox will enable even more relaxation of that hand. Dr. McCann agreed to refer Janet to the hand clinic at KGH where they can make a brace she can wear during the day to further promote a more relaxed position for her right hand. The next round of Botox will be in three months or so using Dr. McCann’s new machine that will allow him to treat Janet’s right subscapularis in hopes of increasing range of motion for her right shoulder. Another big plus that came out of this appointment was the discontinuation of Baclofen. Janet had a terrible reaction to an increased dosage a few weeks ago and the amount she was still on was too low to do any good so now its one less drug for Janet. Yay! Brian followed us home as best he could and took a look around the house to assess what he’d do if we were determined to stay here. We ended up agreeing it doesn’t make much sense then we enjoyed a nice cold beverage in the sun. Janet later commented that its nice having Brian around, “he’s easy to talk to”. Not surprisingly Janet enjoyed herself in our pool with the water being a ridiculous 32 degrees. She still wanted to hot tub afterwards too so I was able to get a good stretch and start working that Botox into her. Quite the busy day so far and Janet easily agreed to have a short nap. I woke her an hour later and positioned her so she could watch for Laurel’s arrival. I really wish I’d recorded that moment as it was absolutely priceless when Janet started giggling and smiling and laughingly saying ” there’s someone here! It’s her, it’s Les, Na, Laurel!” I thought she was going to cry but she just kept on giggling and waving like a star struck little kid. Awesome. The excitement continued as we went back to Connect for a Shuttle and Standing Frame session. Janet was very cooperative I think because Laurel was there and did a good job on both apparatus. There was very little pouting and once given the goal time for getting down from the Standing Frame did a great job using her watch to tell what time it was and how much time she had left. That was a pleasant surprise as she was bang on with fifteen and five minutes remaining. That watch has been a very effective tool so far. Well done Jess! While in the Standing Frame Janet demonstrated more cognitive abilities in correctly identifying Sally Field in a movie that was on TV. Impressive. Wednesday morning the focus was on Janet’s regular therapy routine. She went to the gym for a thorough workout then had Speech with Mary Lou. Laurel and Heather met up with their mom in the afternoon and hung out until bedtime, making sure she got in another gym session. When I arrived with Andrew late into the evening Janet was talking very loud and clear, was obviously excited to see her kids and I think is going to have a really fun time this weekend. One of the more noticeable improvements Janet has made over the last few days has been in the quantity of liquid she will drink at one time. Historically her drinks have been very tiny sips. Now they are not near gulps but I’ve seen her do what would qualify as a shot more than a few times. She still needs to be reminded a lot to keep drinking but there is a definite increase in the speed with which she can down a beverage. The volume of her voice has gotten louder and she is definitely more “with it” than she was even a couple of weeks ago. Praying for continued healing, an increase in her water intake, for the Botox to have maximum effect and for everyone to enjoy themselves at Laurel and Raj 2.0. This has been a relatively quiet week with Janet holding her own in most areas with some more signs of increasing assertiveness. Swimming and hot tubing remain her favorite activities with the Standing Frame taking over from the Shuttle as her least favorite thing to do. Thursday was an interesting day for me as I found Janet curled up on her bed, awake and upset, saying she’d been “yelling for help to get out of here”. Her pendant alarm was right beside her and when I asked why she didn’t push it for help she all of a sudden seemed to feel silly that she hadn’t thought of that. There was no reason to want out other than she couldn’t sleep so from that point on it was a fun day. We went for a long walk to the eastern shore of Wood Lake and saw a large deer feeding on the side of the road. Or at least I did. Despite the thing being only twenty meters in front of us then moving towards us on the road before hopping into the bushes only ten meters away, Janet never saw it. We had lots of time and it was on her left side so I thought for sure she’d pick it out but even with me pointing and turning her head, she saw nothing. As we continued our walk Janet was able to see and tell me about things like boats on the lake, large trees and other landmarks and enjoyed watching a train roll by. I had commented on how close to the tracks a number of homes in that area are and how annoying it must be when a train goes by. We agreed it probably doesn’t happen often. Of course, less than five minutes later we heard the whistle of an approaching train. It was fun watching it and Janet saw it no problem. To wind down the day I assisted Janet in typing an email to her mom. I had to guide her to most of the letters but she did a great job in thinking of what to say and spelling the words as we typed. If y’all wish to correspond with Janet via email her address is jedieno@gmail.com , just remember I’ll be reading them to her and helping with any response. Janet was ready to go home for the weekend when I arrived at Connect Friday afternoon. It had been a quiet morning and even though we had no big plans she was anxious to go. We stopped at Save On along the way and used Janet’s VIP parking pass for the first time. I must admit its pretty sweet to be able to park pretty much at the front door in a nice wide spot and not have to worry about someone parking too close to us. Janet was a big help shopping and enjoyed choosing things on her own. Her help continued as we made a Quinoa salad for dinner with Janet doing lots of chopping and tossing. 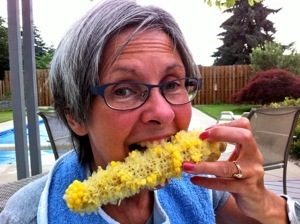 We had dinner outside with Janet reestablishing her authority as the corn on the cob expert saying “this is the best corn of the year”. After a good stretch in the hot tub we watched So You Think You Can Dance with Janet’s legs in the extenders. She loved the show and at one point asked for a paper and pen as she waned to “tell someone I want Amy and Fik-Shun to win”. Not sure who she was going to tell or why but I love the spontaneity of that thought. As bright a moment as that was a short time later she didn’t know my name or that I’m her husband. I’ll let it go as being really tired and that seems to be the pattern with Janet knowing me. She’s good in the morning then by dinner time I can be any name under the sun including ones she makes up herself. Saturday was a sleep in day with breakfast happening outside closer to lunchtime than breakfast. We had a good Skype chat with Mary/Gaga then got Janet’s nails cut and cleaned in readiness for the arrival of family next week for Laurel and Raj’s wedding 2.0. After a nice walk and a good lunch we took off to do some shopping before church as Janet needed shirts and I needed some shorts. It was fun shopping with Janet and she was a big help to me in choosing colors. 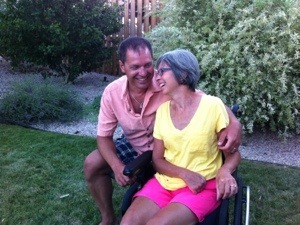 As we were settling in for church Janet asked to have her right arm up on the armrest of her wheelchair. That’s a first and a really encouraging sign as it wasn’t long ago that it hurt her to have her arm in that position. After church, Janet asked for a burger for dinner and was excited to sit outside at Red Robin and devour a Mediterranean Chicken Burger. I had promised her we’d watch a movie that night and she didn’t let me forget even thou it was nine o’clock by the time we started it. We watched Safe Haven which is actually pretty bad but we enjoyed it. Janet was quite restless going to bed and five minutes after lights out I found her on her tummy laughing. She wanted to lay on her left side but turned the wrong way and couldn’t get back. With a little help she got there and fell asleep quickly. The Sunday breakfast tradition seems to be watching Pick a Puppy, a show that follows a family as they choose their pet. It’s very cheesy but Janet loves it and in the true spirit of our TV viewing habits, we’ve made it into a competition. Janet is now three for three in choosing which puppy the family ends up picking. In trying on her new shirts we’ve determined she is no longer a size XS and has graduated to size S. That means more shopping come Fall. Yea. There are enough weeds and plants that need pruning in the front yard that we were able to spend over an hour out there with Janet doing a lot of pulling and clipping. Hard for her to squeeze the clippers sometimes but she enjoyed the challenge and being in the sun. Her reward was a nice swim in a ridiculously warm pool where she did some great lower leg kicking. This is the first time in a while I’ve worked on this with her and once she thought about it she did well with her left and managed a little movement a couple times with the right. She closed her water session with a relaxing hot tub where she got so relaxed that I actually let go of her as she floated on her back. As soon as she realized I’d let go she started to sink but it was pretty cool she could float like that. I tucked her in at 9:45 and twenty minutes later heard a little bang from the bedroom. I was startled to see Janet sitting on the edge of the bed where she had been rummaging through her bedside table. In her hand was an old pair of glasses and she said to me “I’m trying to find the ones that work”. She only cried a little bit then asked to sleep on her left side and as soon as I helped her there she was heading off to la la land. Or maybe that’s where she was when she was sitting up, I don’t know, but it was cool she could get herself up and sitting. A little flash of houdieno. Monday we were back in the Rehab Pool at KGH. It had been over a week and I was anxious to see how Janet would do. Kiko graciously came along to be a cheerleader but I put her to work as videographer and her is the result. We enjoyed a yummy lunch at Marmalade Cafe with Kiko afterwards. Nice way to spend a sunny afternoon. Thanks Kiko! On the way home we stopped at Save On so Janet could pick out the fruit she wanted to take to Connect for the coming week. The team agrees that Janet needs to eat lots of fruit as she doesn’t drink enough water and since she loves it that’s a pretty easy thing to do. From now on, like home, her breakfast will be a large bowl of fruit and yogurt, a piece of toast and peanut butter and a little coffee if she wants. Coupling this with as much fluids as possible should get Janet more regular on the toilet. I can report today that it seems to be working. Tuesday morning was busy for Janet as she got back into the Connect routine. I took her out of that for the afternoon so she could get her haircut. Chelsea always does a good job with Janet and the whole experience was fun with Janet being much more talkative than last time. For her evening workout, Janet was good about going on the Shuttle but put a big pout on during her Standing Frame session. So much so that I thought she was quite rude to one of the other residents who tried giving her some encouraging advice. Janet was having nine of it and gave that person the silent treatment until they complimented her on her hair. That brought a big smile and a thank you. In the Standing Frame tonight, Janet was in a much better mood and surprised me by accurately predicting when the session was over. I had set nine o’clock as the end time and using her watch she guessed at 8:43 that she had twenty minutes left and at 8:55 she knew there were only five minutes left. The funniest bit was when she stared at her watch for the last thirty seconds and when it reached 9:00 she proudly held it up to me and said “I’m done”. Indeed. Cognitive gains like that continue and are very encouraging. Even her negative outbursts are good I guess as she is expressing her opinion and feelings much better. She still lacks confidence in a lot of things, using a stock answer of “I don’t believe it”, when someone tells her something good about herself or tries to explain the benefits of doing something she doesn’t like doing. The only way I see of battling this is to identify every moment she does something well and explain why it’s good and where it can lead her. Pill swallowing is getting much better for Janet as well with most doses going down on the first attempt now with hardly any coughing. I notice she coughs a lot less drinking apple juice and drinks it a lot faster too. Not sure why. Janet still has a hard time with my name and knows it better earlier in the day as opposed to late at night. The family names usually come to her pretty quick but she needs prompting for the staff members names usually. We’ve stared reading at night again and Janet seems to be understanding what I read a little better now too. This coming Tuesday we meet with Dr. McCann for another round of Botox. I think the timing is perfect as although there is still good flexibility in both of Janet’s legs the left one is tightening up and the right one is pulling into the left a lot. That hasn’t stopped Janet from doing well on the Shuttle and her pole transfers a very good with a noticeable improvement in balance. This past weekend was the first one driving the Vibe and the first one that hasn’t left me with a very sore shoulder as I no longer have to lift Janet into the car. Nice. Looking forward to more progress this week and the arrival of family ahead of Raj and Laurel 2.0. 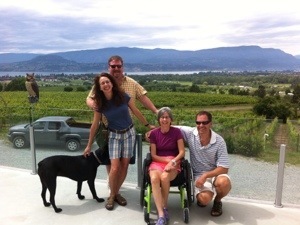 This was pretty much a fun filled week for Janet as her sister Leslie and her husband Gavin were here for most of it and the weather finally kicked into summer mode. Thursday started off slow as Janet seemed rather tired in the morning but her energy increased as the day wore on. Jess reported that Janet made it through her parallel bars workout but was nodding off by eleven. Mary Lou gave a similar report saying Speech was pretty much a none starter. I couldn’t really think of why Janet would be so tired. She says she isn’t sleeping well at night but there’s no accurate way to measure that. I considered making a quick doctor’s appointment for her but her doctor is on vacation until July 9th and I didn’t see any point in going to the substitute. By the time we were on our way downtown for an appointment Janet was starting to perk up and by the time we got home she was fairly bright. We went for a nice long walk while Leslie and Gavin made dinner which we enjoyed very much, including a glass of wine, something Janet hasn’t had much of lately. Her conversation skills were good and she was even cooperative about going back to Connect. There was a meltdown in the car on the way out there as she expressed her disbelief in the fact she is doing really well. She was quite emotional but got it together by the time we arrived and managed a half hour in the Standing Frame. That was all I was going to ask for as it had been a busy day. I still haven’t learned to stop nagging her about water and that night Janet actually swore at me about it. I’ll take it as a positive expression of her feelings although at the time I told her she was being quite rude which of course brought the tears. Janet ended the night with a spectacular pole transfer to her bed ninety percent unassisted. and agreed CedarCreek is gorgeous. Dinner was a massive amount of sushi enjoyed outside until around nine when Janet started getting a little cold. That’s what hot tubs are for and just before eleven I said goodnight to a tuckered out Janet. I don’t know if it was the wine, sushi or the relaxing hot tub but Janet woke up Saturday morning in one of the brightest moods yet. I’ve never heard her laugh so hard and loud as she did while telling Leslie the story of when Heather accidentally ate a huge glob of wasabi. You could hardly understand a word she was saying but every once in a while a key word would pop through and you could follow the gist of the story. But the story didn’t matter as it was pure joy watching Janet laugh so much. The laughter continued as we hauled out some old dresses Janet had from her grandmother and Leslie tried them on for fun. I have to say they weren’t as hideous as I thought they were going to be. We got out for a nice walk before lunch then it was time for a swim. Or so I thought. Apparently twenty nine degree water is too cold for sensitive little Janet so back to the hot tub we went as we spent a nice afternoon on the deck. 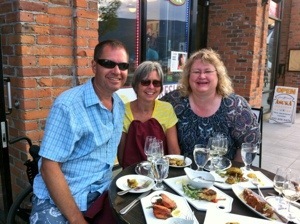 This was Leslie and Gavin’s last night in Kelowna so we planned a dinner out at a new restaurant called Smack Dab. In the process of getting ready I left Janet on the toilet while I fed the dog. A few minutes later I heard a cry come from the bathroom so I ran back to find Janet in tears on the edge of the seat telling me “I want to get up and put my makeup on myself”. Wow, where did that come from? No one had mentioned make up to her that I heard so I was really impressed with that statement and how she thought she could get up and do that on her own. One day. 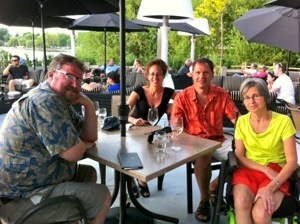 Dinner outside by the lake was yummy and a terrific way to start the farewell proceedings for Leslie and Gavin. Dessert in the hot tub at home was a fun way to end the day. Leslie and Gavin had to leave us at eight AM Sunday and Janet woke up at 7:30 but was too tired to get up, so the goodbyes took place bedside, which limited the tears, thank goodness. 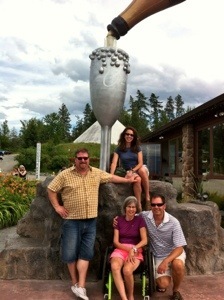 It was fun having some Ontario peeps around for the week and Janet benefitted immensely from all the social activity. The first part of Sunday was pretty quiet. We made it to church but Janet was kinda sleepy and had a good nap when we got home. The pool was a little warmer as was the air temperature so Janet got some good swimming in, doing the best kicking she’s done yet. The house got super hot by dinner time so we headed downstairs for the evening and watched So You Think You Can Dance. A pretty good recovery day for Janet. Monday was all systems go in the morning as Janet woke very chatty and bright. She had a good Skype chat with Laurel before the first swimming session of the day. Thirty one degree water apparently is still a little cold but Janet tolerated it and swam her first full length of our pool on her tummy complete with full freestyle motion of her left arm. Impressive. 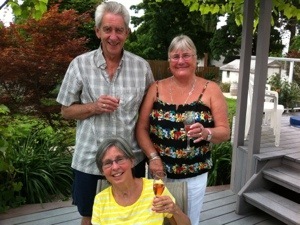 Our good neighbors Barb and Gary joined us for a glass of wine that afternoon and Janet started to tire noticeably then. Nice to share Canada Day with good people though. Janet and I went for a nice long walk to shake the cobwebs out of her and it seemed to work. When we got back I had her try and transfer into and out of her Pontiac Vibe and she did so almost effortlessly. I managed to get the wheelchair into the back without folding any seats down and so decided to go for a spin to make sure Janet is comfortable in that car. It’s been parked since last September and I when I told Janet we were going for a ride she said “isn’t that illegal?” I was shocked she came up with that and asked her how she knew and her reply was simply “I just knew”. Indeed. It now makes total sense to use the Vibe since Janet can transfer into and out of it with only a little help from me and its more economical to run as well so the switch will be made. Our second swim session of the day was a chance to cool down if nothing else but Janet did some good kicking and loved me helping her “jump” up and down in the water. Big smiles. Connect had some staffing shortages Tuesday so Janet was unable to do much of anything the first part of the day and complained of boredom when I arrived early in the afternoon. She did have Singing with John which she acknowledged was fun. She must’ve been bored though as she agreed to go to the gym with me and did a solid job on The Shuttle. With lots of time before dinner we set out on a very hot but interesting walk to a wildlife sanctuary down the road from Connect. Most of the wildlife was hiding from the heat but we could see the potential for some cool sightings in cooler seasons. Janet did a great job chopping up some chicken for a stir fry when we got back but then got a little negative as we practiced writing her signature for a while. She wasn’t doing very well so decided to go with the “I don’t care” and “it doesn’t matter” lines that make me mad. Garrett saved the day by taking her to the gym for a full workout that he reported was very good. Janet was in a much better mood after the exercise and wanted to go for a walk. We played I Spy along the way and she did reasonably well getting a satellite dish for something round and the sun for something setting. Jess reported Janet had a very busy morning today with an hour and a half in the gym doing every type of exercise she knows followed by Speech with Mary Lou who reports Janet has rebounded nicely from the sleepy times last week and continues to build her vocabulary. She was in bed when I arrived just before two but wide awake so I got her up and we went on a long walk in search of a Fresca. I got a good workout, Janet got some more sun on her and we both enjoyed the drink after the long search. I had Janet practice some handwriting before dinner and was pleased with her progress. Garrett and I took her to the gym after dinner for another good go at The Shuttle followed by a good stretch from Garrett. Another request for a walk resulted in another game of I Spy along with learning compass directions. Janet and I were both impressed by how friendly people in the neighborhood around Connect are. We got lots of hellos and waves tonight. Almost makes us consider living there. Almost. Janet continues to make progress in all areas except toileting and I’m a little concerned that she is feeling bored at Connect. Her increased brightness has allowed her to go a number of days without a nap now and its only because of the nice weather that we’ve been able to get out and do something. I think we need to find more things for her to do during the day. Praying for continued healing, more control of her right leg and perseverance in doing the good things that aren’t so much fun.